This was originally published on Monday, August 21, 2017, in the Pacific Daily News. Click here to subscribe to the PDN. Almost everyone uses a credit card these days especially with the boom of online retail. You can’t rent a car or make a hotel reservation without one. The ease of swiping your card makes it too easy to pay bills or cover you in case of an emergency. This ease of use can also land you in deep debt. Before making the decision to get a credit card, consider these pros and cons. Purchasing power: the power to make a purchase while traveling overseas, online, by phone and of course in the store. Many of the large credit card issuers like Visa and Master Card are accepted nearly everywhere. Financial backup: In case you have an unexpected event like a busted pipe in your kitchen, your credit card can be used to pay for parts and, in some cases, a plumber without going to an ATM. They can also help in case of a health care emergency or an expensive auto repair. Rewards: Some cards will reward you for using their credit card for every-day purchases such as gas or groceries. Others will reward you when you travel or award cash back as an incentive. Credit score: If you use your card wisely it will certainly help your credit history. It can also help repair your credit by showing how responsible you are by making your payments on time. Pay later: It has happened to the best of us, and we run short of cash and need to buy groceries or fuel. You are able to make your purchase and pay it off later. Protection: Credit cards allow you to dispute billing errors and some even provide insurance for expensive purchases. Most credit cards are now equipped with an EVM chip. A Europay, MasterCard and Visa chip is a global standard for credit cards to authenticate and secure transactions. The EVM chip is much harder to hack than a swipe strip. In the case of a fraudulent transaction, the card holder is usually protected. Interest: A high annual percentage rate can send you deep into debt if you do not make significant monthly payments or pay your balance off. More usage: Studies have shown that people tend to purchase more when they use a credit card. Some feel compelled to spend more than what they have. Late fees: If you do not make a payment you incur a late fee. Although it may be $30 to $50, it adds up quickly if you repeat this habit. Sometimes consumers will allow the balance to roll over for several months racking up interest and late fees. Bad credit: Studies have shown that many people fall into serious debt due to poor credit card habits. Carrying a large amount of debt and acquiring too much debt can ruin your credit score. After weighing the pros and cons and understanding the type of credit card that is suitable for you and your lifestyle, remember to keep track of your purchases, avoid overspending and make timely payments to avoid extra fees. Use your card with reputable businesses and if your card is lost or stolen, report it to your credit card company as soon as possible. This was originally published on Monday, April 24, 2017, in the Pacific Daily News. Click here to subscribe to the PDN. As April comes to a close, so does Financial Literacy Month. In these times of economic uncertainty, money management is a necessary life skill. Many of us are not taught how to handle money or prepare ourselves for the future. Most of the time, we learn as we make mistakes. Sometimes we bounce back, but sometimes it is a life of continuous hardship. Being prepared makes a huge difference when dealing with money management. Plan. You can’t go through life not having financial goals. The only bad plan is a plan not followed. You must plan for your future. Plan for all your major expenses like home ownership, a car, schooling and periodic expenses. Goals. What are your short-term (less than one year), mid-term (one to five years) and long-term (more than five years) goals. Make sure your goals are specific and reasonable. Develop a budget. Determine your living expenses, periodic expenses and monthly debt. Create a budget that can be realistically followed. Follow your budget as closely as possible and evaluate it at least twice a year. Keep your expenses under control. Try to spend only the money you make and not use your credit cards. Do not incur other debt until you are able to manage the debt you have now. Know where your money goes by keeping a log of all your purchases. Save. Save up for major purchases such as cars, homes, vacations and major appliances. Experts say that saving 10 percent of your paycheck will add up to a nice savings account. Create an emergency fund with about three to five months of your expenses. Start saving for retirement — the sooner the better. Need vs. want. Sometimes we have a hard time distinguishing between the two. Needs are must-haves to survive and wants are things we crave. We may need a new car, but we may want a car that is beyond our financial means. Determine your financial priorities to guide your spending choices. Take care of your needs first. Then, if you have some money left over, you can use it for your wants. Credit. If you must use credit, do so wisely. Use credit for planned purchases only. Determine what amount you can afford to purchase on credit. A golden rule is not to allow your payments to exceed 15 percent of your net income. Do not use one form of credit to pay another and repay the credit back as soon as possible. Treat yourself. What good is working if you can’t enjoy your money? Even if it’s a little treat like ice cream or a dinner out, enjoy the fruits of your labor, or it will become very hard to follow a budget or stick to your goals. Don’t get consumed by material things. Trying to keep up with the Joneses will only lead you to financial ruin. Live an enjoyable life but within your means. A 70- inch flat screen television is nice, but so is living debt free. This was originally published on Monday, October 31 ,2016 in the Pacific Daily News. Click here to subscribe to the PDN. Halloween is a time to be spooked by zombies and witches. As we grow older, our fears become less of the supernatural and more of the actual. In the personal finance world, many fear the unknown such as their credit score. Your credit score is your financial report card. It lets you know how well you are doing financially. Your credit score is a tool used to measure how reliable you are in repaying your debts. Your credit score is also known as your FICO score. Fear stems from the unknown. If you take time and understand what and how your score is calculated perhaps it would be less scary. There are three credit bureaus that keep track of your score: Equifax; Experian and TransUnion. The three bureaus usually have three different scores, because each company uses your information differently and not every credit issuer reports to every bureau. There are five major factors that go into calculating your score. Payment history is about 35 percent of your score. This factor will show lenders your accounts, past or current. This section also tells the bureau how well you meet your payment deadlines and if you are behind, how many days you are past due. It also reports if you have missed payments. This category also shows if your accounts have been turned over to a collection agency or if you have filed for bankruptcy. Current amount owed will factor for about 30 percent of your credit score. Recorded in this area are the number of credit accounts you have such as credit cards, loans, mortgages or in-store credit cards. Your balance on each account is also noted. High balances or large amount of debt from many sources will lower your score. Also, having a lot of credit with no debt could have an adverse effect on your score. Usually small debts that are paid off in full will raise your score. Length of credit history will calculate for about 15 percent of your score. This section concentrates on how long you have maintained your credit. For most creditors, time equals stability. Having a credit card but not using it can actually drop your score compared to carrying a balance on a few different accounts and paying them off on time. Types of credit used will count towards 10 percent of your score. Being more varied in the types of accounts you use will increase your score. A person who carries only one credit card may have a lower score than a person who shows that they can responsibly manage more than one account. New credit inquires accounts for the last 10 percent of your score. There are two types of inquires that can be made a soft inquiry and a hard inquiry. A soft inquiry can be from a financial institution or potential creditor just wanting to look at your score, a perspective employer or you viewing your credit history. Soft inquires don’t affect your score. Hard inquires come from a financial institution that you have applied for a line of credit or loan, such as a car dealership. The increase in hard inquires lowers your score. Usually, if someone has opened a lot of accounts in a short time period, it may suggest potential financial troubles. Become familiar with your credit score. It’s a valuable tool that can keep you from being frightened of your financial well-being. Michael Camacho is president and chief executive officer of Personal Finance Center. He has more than 20 years of experience in retail banking and at financial institutions in Guam and Hawaii. 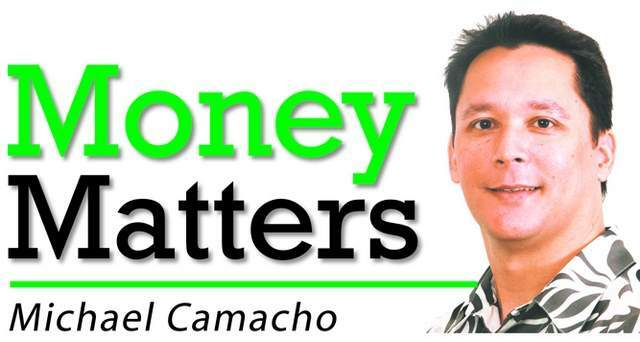 If there is a topic you’d like him to cover, email him at moneymattersguam@yahoo.com and read past columns at the Money Matters blog at http://www.moneymattersguam.wordpress.com. This was originally published on Monday, July 11 ,2016 in the Pacific Daily News. Click here to subscribe to the PDN. Every day we make decisions that have good or bad consequences for our future. It is important to teach your new high school graduate about finances before starting off in the real world. Doing so helps them make smarter choices in the future. Becoming financially responsible is a big step into the real world and will become one of the largest challenges they will face. Student loans. The cost of university is becoming more and more expensive. Due to the increase in price, many more college students are taking on student loans. Many students think that because the payment is deferred until they graduate it gives them leeway to use it for other purposes than just for school needs. Take only what you will need for tuition, books, supplies and housing. With a tough job market, it can take some time to find a job which will allow you to start paying off your loans. You will be happy to have taken the bare minimum. Taxes. If you are going right into the job market or working while in school, it is imperative that you start paying taxes. Just because you don’t make much does not exempt you from paying your taxes. Nonpayment can hurt you in the long run. It could cause your wages to be garnished or it could prevent you from being hired for a job. Emergency fund. Start saving for an emergency. You will be thankful that you have an emergency fund if your car breaks down or you lose your job. The best time to start is when you have fewer responsibilities. Once you get a mortgage, children and insurance, it will be harder to put money aside. Think about your credit. Your credit history will pretty much follow you around for the rest of your life. Ensure you make your payments on time. Even though right now you are not in need of a mortgage, some day you will be and you will be thankful that you have a good score. Most utility agencies, jobs and landlords now run credit checks on their customers to see how credit worthy they are. Health. Continue to take care of yourself. Get annual checkups for your dental, health and vision. One of the largest expenses most people pay is for medical attention. Eat healthy, get lots of exercise, and stay away from drugs and alcohol. Be sure you are insured, it will help tremendously when it comes to paying for doctor’s visits, medication and treatments. Invest. Retirement may seem a long way off. Eventually you will want to retire. How old do you want to be when you retire? Your decision should decide how aggressively you invest. If you want to retire at 50 years old and travel the world, put more money aside. Open an IRA, invest in stocks, bonds or even real-estate. Social Security is no longer enough to retire on. There is a lot to think of as a young adult. If you plan and stick to your plan, your financial future is a bright one. Take care of yourself and your finances. Your future self will thank you. Michael Camacho is president and chief executive officer of Personal Finance Center. He has more than 20 years of experience in retail banking and at financial institutions in Guam and Hawaii. If there is a topic you’d like Michael to cover, please email him atmoneymattersguam@yahoo.com and read past columns at the Money Matters blog at www.moneymattersguam.wordpress.com. Last week, we talked about preparing to buy a home by ordering and reviewing your credit reports and scores. Today, we’ll discuss improving specific areas of your creditworthiness, to put you in the best position possible as you apply for a mortgage. Establish a pattern of paying on time. On your credit reports, each account includes a record of your payment history. Each month will be marked as “Paid as agreed,” or late, along with the length of time in which the payment was late, in 30-day increments. When lenders look at your credit history, they want to see that you consistently pay on time. When considering a mortgage application, with a term that can last as long as thirty years, lenders look to your past history to predict the future pattern of your payments. If you frequently pay late, and your late payments are recent, this can indicate credit risk to a financial institution. To lessen the potential costs that come with that risk, a financial institution may charge higher interest rates than they would offer to a lower-risk applicant. If you have this pattern, first recognize that this negative information stays on your credit report for a finite period of time: in most cases, seven years. With time, you can replace negative marks with positive ones. Next, your most recent behavior will be considered more heavily when your application is evaluated. If you take the time to establish a good pattern now, that can lessen the effect of negative information. To change this pattern, find the source of the problem. If you’re simply forgetting that certain bills are due, then email reminders, calendars, and automatic payment plans can help a great deal. Experiment with different tools to find what works for you. If you haven’t been able to pay bills on time because you have been experiencing shortfalls, this requires a deeper fix. The first step is to carve spending down to your most basic needs. Make a list of your essential expenses, and total them. If this amount is less than your monthly income, it’s a question of sticking to those monthly expenses, as you would stick to a list at the grocery store. It can be difficult, but with time, you will adapt to the new spending level, and establish a healthy pattern of paying bills on time. Another option is to look for ways to increase you income, so that you can comfortably pay your bills on time. Bring down your credit balances. As we talked about in an earlier column, the amount of credit you use will impact your creditworthiness. Lowering your credit balances will help improve your score. Limit your applications for new credit. If lenders see that you are opening several new credit accounts in a short period of time, they can view this as a credit risk. It’s best to limit new credit applications only to what you need, and to refrain from new credit applications in the immediate period of time before you search for a mortgage. Hang on to your credit cards. When you close your accounts, this lowers the total amount credit available to you. Rather than closing them to avoid credit card use, keep them for emergencies and store them away. Your credit reports and credit score are among the most important tools that financial institutions use to evaluate your mortgage application. Your credit reports inform your score, and a drop or a rise in your score can have a great effect on the amounts you pay throughout your loan term. As a mortgage applicant, it is very important to review your own credit reports for accuracy. It’s also important to review your own negative financial habits, as they are reflected on your credit reports, and work to correct them far in advance of shopping for mortgage loans. With enough time, you can change your current financial habits into healthier behavior. Those behaviors aren’t just important for your application—they can preserve the quality of your credit through your mortgage term, and keep you out of financial trouble. Evaluate your credit early. If you review your credit reports and scores at the time that you start saving for a down payment, you give yourself plenty of time to correct existing mistakes. You will also have time to establish a lengthy, positive pattern of behavior to replace any negative marks on your credit report. Order all three credit reports. Experian, Equifax, and Transunion are the three major nationwide credit bureaus. They collect data from lenders on owed balances, credit limits, your history of payments, and other information that can indicate your creditworthiness. Because a mortgage loan may be the largest loan you ever apply for, you don’t want to leave anything to chance. With all three credit reports, you can review the information that a financial institution will see, and work on improving that information. You’re entitled by law to one free credit report every 12 months from each of the three major credit bureaus, which you can obtain through the official website www.annualcreditreport.com. You can also link to this website through the Federal Trade Commission, www.ftc.gov. Review your reports and your spouse’s reports together. When you’re purchasing a home with your spouse, your mutual credit will determine the results of your application. This early review helps you lay out a game plan for improving your credit together. Whether the problem is high balances or late payments, you can support and reinforce positive changes in each other, and rehabilitate your credit that much more quickly. Check your credit reports for errors. Look for any accounts that you didn’t open yourself, and report fraudulent activity as soon as possible. Also pay special attention to credit limits and any late payments that are listed on your credit report. Verify whether or not they were late, and if you find a mistake, go to the lender and correct it. It can take time to process a correction, so an early review is essential. Order your FICO scores. Your credit score is shorthand for your credit quality. When you see where you fall on the credit quality range, you can determine how much more work you have to do in improving your credit. You will have to pay for FICO scores, so first decide if the snapshot will be worth the cost. Next week, we’ll review specific steps you can take to improve your credit. Michael Camacho is president and chief executive officer of Personal Finance Center. He has more than 19 years experience in retail banking and with financial institutions in Guam and Hawaii. If there is a topic you’d like Michael to cover, please email him at moneymattersguam@yahoo.com.